For me, designing a small space is so much fun! Not only do you have to get creative to maximize what you are working with but there is no better time to be bold and use that pattern, wallpaper, or color that you’ve been eyeing that might otherwise be too overwhelming if the space was larger. These choices can turn a room that initially might have felt underwhelming and transform it into something that feels special. I had the opportunity to design these two small bathrooms (each around 5ft x 8ft) when my mother-in-law bought a condo near us earlier this year. She lived with us while house hunting and then while the renos took place, so you could say I had extra motivation to get the job done! This is the after of her guest bathroom. 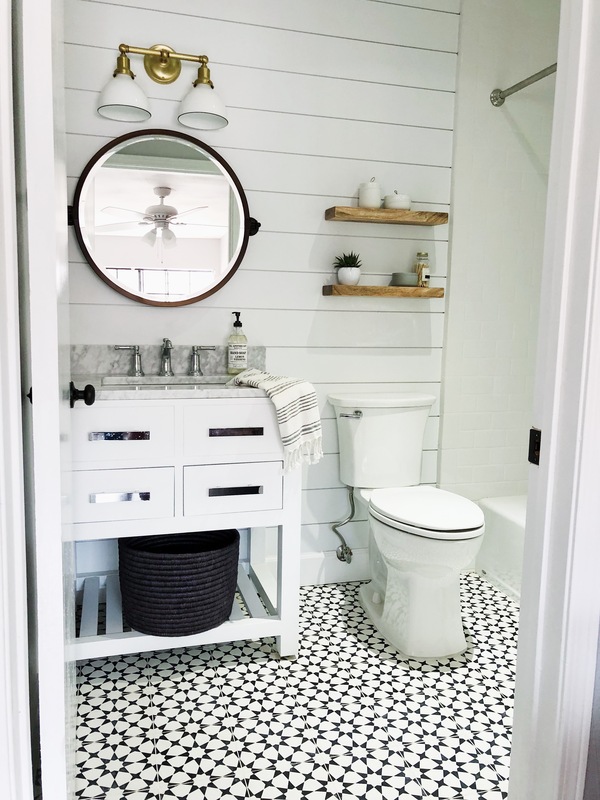 I used this bold and beautiful cement tile by Riad Tile (Shop Tile Here) for the floor, and the large pattern instantly made the space feel bigger. This tile is the first thing you notice about the bathroom, not its small size. I kept the rest of the room white, but added shiplap behind the vanity which also helped to cover up the textured wall that was there. TIP: If going bold like this is out of your comfort zone, stick to a black and white color scheme to make it feel more classic. In her master bathroom, I went for a dark and bold color on the focal wall. Dark walls are having their moment right now, but I think when the rest of the room is kept light and bright it can go beyond the trend and keep the space fresh and interesting. I also opted to do a geometric marble tile by Floor and Décor on the floor. There is just something luxurious about having marble in a master bathroom! Here are some examples of bold choices in small spaces. TIP: If you don’t have the budget (or DIY skills) for wallpaper, try decals! Or if re-tiling is not an option, try painting and stenciling a pattern to your floor. Go ahead and take the risk because you’ll probably end up being pleasantly surprised!